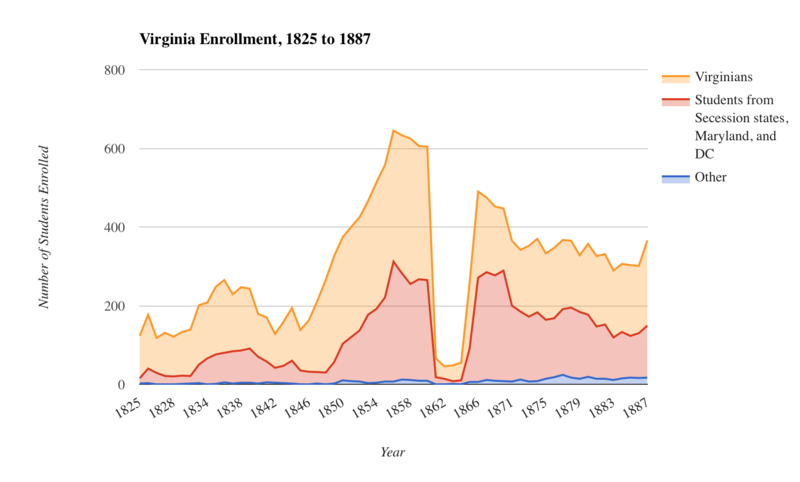 Below is a graph of student enrollment at the University of Virginia beginning with the school’s first session in 1825 and continuing into the early postbellum period. The graph was created using data from the University’s early catalogues. Students are split into three categories: Virginians, other southerners, and other — students from north of the Mason-Dixon line, the midwest, the west, or other countries. The most visually striking feature of the graph is also its least surprising. The Civil War decimated enrollment. In 1860, total enrollment was 604; in 1861, just 66 students attended the University. When war broke out, young men abandoned their studies and rushed off to fight, with few exceptions, for the Confederacy. What’s far more surprising about this graph is what happens just before the Civil War. In 1845, 138 students were enrolled in the University. Eleven years later, in 1856, that number had more than quadrupled, as the 1856-57 session saw a record 645 students enrolled. In the 1850s Virginia was larger than even the most prestigious and established private schools like Harvard and Yale (Wall, 2). This dramatic leap was caused by a mixture of small administrative changes, shifts in the internal culture of the school, and growing national division between the North and the South. In the late 1840s, in part because of the actions of the school’s administration, student life at the University changed for the better and became more appealing to many young men. Meanwhile, tension between the North and South grew, and affluent southern families sought to keep their sons in the South rather than send them to the old schools of the North. Primary documents from this period provide evidence that administrative changes played a role in the school’s growth. First, the University began to provide free admission to a set number of qualified Virginian students. In the Board of Visitors meeting on June 25, 1846, the Board resolved “one Student from each Senatorial district, qualified to enter the University according to the enactments shall be received at each session hereafter, without payment of the Professors fees, & without charge for any of the University dues, fines & penalties excepted.” The process for selecting state students was at least in part based upon helping students who otherwise would not have access to the University. “In making such selection the Faculty shall regard as well the capacity, as the moral fitness of the Candidate, and shall have satisfactory evidence, that the applicant his parent or guardian is not in a situation to incur the expenses of his education,” the Board resolved. The expansion of the state student program indicates that the board did, to some degree, desire to expand the school’s enrollment. The way they talk about the expansion suggests a feeling of duty to the state — they felt expansion would, in the words of the meeting minutes, “diffuse as far as practicable through the State the benefits of education at the University and thereby to extend its usefulness.” Funding the state student program surely contributed in part to the increase of Virginian students from 103 in 1845 to 337 in 1855. A series of other seemingly small institutional changes made during this period aggregated to change the culture of the school for the better, making the University safer and more appealing to many prospective students. In the first twenty years of U.Va.’s existence, relations between the students and the faculty were rocky at best, and the faculty minutes abound with reports of rowdy drinking and disrespectful behavior towards the faculty and other school authorities. Two incidents are in particular indicative of the University’s struggles during this time. The first is the killing of Professor John Davis (P33195) in 1840. A pair of masked students were wandering the grounds at night firing pistols for fun, a fairly typical activity for students of the time. Professor Davis tackled one of the students in an attempt to identify him and was fatally shot at close range (Wall, 174). The second is the student riot of 1845, in which a group of “50 or more” organized students gathered in the night to make noise, ride horses, deface University buildings, and fire pistols (Faculty minutes, 1845). Class was cancelled for a week and a state militia was called in to control the outbreak. 38 students were dismissed for having participated, which is the cause of the downward tick in the enrollment graph just before the beginning of sustained growth in 1846. For the first twenty years of its existence, the University of Virginia was not an environment conducive to learning (Wall, 209). A number of administrative changes in the 1840s ameliorated the school’s disciplinary issues and no doubt contributed to the University’s rapid expansion. In the 1830s, an early-rising rule was strictly enforced. Students were often forced to be out of bed by 5:00 in the morning, and those who lagged were reprimanded (Wall, 165). Faculty also strictly enforced a dress code, much to the annoyance of the students. Charles Ellis (P43085) writes in 1835 that “the Faculty have had a meeting to try the fellows who wore rebellious coats and those who wore shorts” (Head). The Faculty made a big show of enforcing these persnickety regulations and thus created an adversarial relationship between themselves and the students. The abolishment of the early-rising rule in 1842 and the uniform rule in 1844 immediately helped to make the school safer and more appealing. In 1842, newly minted Chairman Henry St. George Tucker (P43676) delivered the session’s opening speech, emphasizing discipline based on adherence to the rules under which both the students and faculty lived. The students were so enthused by the speech and the new rules it represented that they asked to have it published (Wall, 254). In addition, a temperance movement began to take hold at the University in the latter half of the 1840s. The first temperance society was founded at the University in 1842 and began to exert serious influence in 1845, when 70 students signed a pledge to abstain from alcohol. Though drinking was still common, it became less contentious and rowdy (Wall, 79). An incident recorded in Socrates Maupin’s (P43731) 1855-56 Chairman’s Journal exemplifies the more congenial relationship between faculty and students. A student named Thomas T. Johnston (P27776) was called before Maupin for the second time in the session for being drunk. Maupin was on the verge of dismissing Johnston when he and 14 other students signed a petition promising to join the Sons of Temperance if Johnston was allowed to continue. Maupin consulted with the Faculty and “concluded that the interests of discipline would be subserved, by accepting the offered pledge” (Chairman’s Journal, 1855-56). Fifteen years earlier, Johnston surely would have been swiftly dismissed, which in turn would have angered his friends and fellow students. The disciplinary reforms of the 1840s greatly improved student-faculty relations, made the University a much more appealing place, and doubtless contributed to the school’s rapid growth. However, the Board of Visitors’ meeting minutes from this period suggest that the administrative changes made were not the sole reason for the school’s dramatic expansion. The members of the board discuss the school’s swelling enrollment in a tone wavering somewhere between matter-of-fact and worried. This growth surprised them, and the minutes reveal that the school’s infrastructure was not ready to take on so many new students. In 1849, the University was forced to rearrange the way it scheduled its lectures. “The duty of arranging the lectures in the different schools of the University so as to prevent any interference or serious inconvenience to the Students has become from year to year a more difficult task,” reported the faculty in the annual Board of Visitors meeting. “This session, however, it has been found utterly impossible to make such an arrangement, owing partly to the considerable increase of the number of Students.” During the same meeting, the Faculty stressed the “urgent want of additional lecture rooms — A want heretofore productive of most serious inconvenience and calculated materially to affect the usefulness of their instruction, should the present number of Students continue or increase” (Board of Visitors minutes, 17 October 1849). The next year a “Committee of Inspection” emphasized to the Board “the necessity of providing without delay enlarged space for the accommodation of many classes by increased numbers too large to be accommodated at lecture with such a regard to health or comfort as prudence demands” (Board of Visitors minutes, 28 June 1850). The University’s logistical and physical infrastructure was insufficient for the new students. The growth was not intended to be so dramatic. The Board, for their part, resolved in 1850 to procure “300,000 bricks to be used in the erection of such additional Buildings as may, in the opinion of the Board of Visitors become necessary for the successful operation of the University” (Board of Visitors minutes, 28 June 1850). From 1845 to 1850, enrollment nearly tripled, and the board was playing catch-up. Though the administration took action in the late 1840s to grow the school, it’s clear that they were unprepared for the number of new students they soon faced. If the growth was not entirely the result of internal change, further explanation for the University’s transformation must be found by looking externally. In the 1850s sectional tensions between the North and South were rapidly growing. As a result, many southerners who would have sent their children to northern colleges chose instead to keep them in the South. This trend is reflected in the graph — the growth is driven by non-Virginian southerners. In 1848, 30 students from secession states, Maryland, and Washington, D.C. were enrolled, a contingent making up roughly 11% of the school’s total enrollment. By 1856, 305 such students were enrolled, and roughly 47% of the University was comprised of southerners from outside Virginia. The large numbers of new southerners were arriving at U.Va. because they and their families felt they couldn’t go north. “Southern life, habits, thoughts, and aims, are so essentially different from those of the North, that here a different character of books . . . and training is required,” wrote one magazine in 1851 (McPherson, 431). Northern colleges were perceived as agents of abolitionism and thus mistrusted by wealthy southerners. In 1859, a Mississippi newspaper told its readers that “there is every reason to expect that young men sent for education to Harvard or Yale will come back poisoned with anti-slavery heresy” (Groen, 29). The enrollment at northern schools during this time period also reflects the effects of growing sectional tension. Many schools saw their population of southern students dramatically decrease in the lead up to the Civil War. One institution which kept particularly comprehensive and well-organized enrollment records is the University of Pennsylvania’s Medical School, and closely examining the enrollments at Penn can shed further light on the ways in which sectional tensions manifested themselves on campuses. Below is a graph of the total enrollment numbers for the Penn Medical School during U.Va.’s pre-war growth period, split in to Northern and Southern students. This graph tells a slightly different story than the graph of U.Va.’s enrollment, but both graphs underscore the strong effect of rising North-South tension on enrollments. The U.Va. graph suggests that sectional tensions rose steadily during this period and that student enrollments changed steadily as a result, with the number of new Southern students continuously rising. 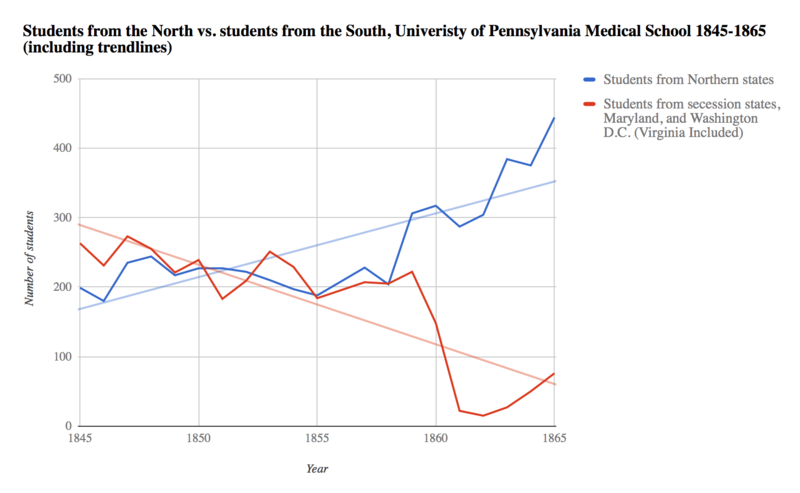 The Penn graph suggests that North-South animosity reached a boiling point just a few years before the actual war began, and that students began to respond in the late 1850s. Though the inflection points are different, the effect on display is the same: sectional tension caused southerners to leave northern schools and return home. The reason the graphs aren’t perfectly comparable is a result of the fundamental differences between the two institutions. Penn’s Medical School was one of the premier medical schools in the nation at this time, roughly three times the size of Virginia’s. Philadelphia was a national center of medical research, home to other important institutions like the Jefferson Medical College, the Philadelphia College of Medicine, and the Pennsylvania Hospital (Poethig). It makes sense that southern students at Penn would have been hard to dislodge from their impressive institution. They likely would not have headed south unless they felt they had absolutely no choice. Yet leave they did. On December 21, 1859 — a year and a half before actual fighting began — 200 students from Penn and other Philadelphia medical colleges boarded trains for Richmond and never returned, choosing instead to further their education in the south. From 1859 to1861, enrollment of southern students at Penn fell from 222 to 22. “Southern pride, rather than administrative mistakes or severe competition, caused the decline in Penn’s enrollment,” declares an exhibit on Penn’s University Archives and Records Center website. Sectional tensions mattered, even to students entrenched at prestigious places like Penn. The agitation affected U.Va. earlier than it affected Penn, but it certainly played an important role at both institutions. There is plenty of anecdotal evidence of students and even faculty transferring directly from Northern schools to U.Va. during this period. Rev. Dabney Harrison (P34260) was a member of the Princeton class of 1848, but returned to Virginia for law school. Harrison’s brother’s roommate at Princeton, Basil Gildersleeve (P43681), was class of 1851, but after graduating returned south and became the classics professor at U.Va. Harrison was later killed and Gildersleeve wounded while fighting for the Confederacy (Maynard). Their stories exemplify the effects of growing sectional tensions. Regional loyalties were emphasized in this period, and the result was a greater number of southerners in attendance at the University of Virginia. The school’s rapid growth in the decade before the Civil War was caused by a combination of internal and external factors. New Virginians were attracted by the inception of scholarships for in-state students. The quality of life at the University increased during this period thanks to common-sense disciplinary reforms implemented by the faculty. Meanwhile, North-South tensions grew in the run up to the war. Students from the South chose to stay in the South, and southern students who had ventured north returned to Virginia to further their education on friendly soil. Thanks to the cultural shifts in and around the school, University enrollment quadrupled from 1845 to 1856. Paradoxically, this tension over abolition soon precipitated an enrollment collapse even more dramatic than the growth, as the 645 students in attendance in 1856 dwindled to just 66 by the beginning to the Civil War five years later. Head, Ronald B., ed., “The Student Diary of Charles Ellis, Jr., March 10- June 25, 1835,” The Magazine of Albemarle County History, 1978. Maynard, W. Barksdale. “Princeton in the Confederacy’s Service.” Princeton Alumni Weekly, 23 March 2011. McPherson, James. “Antebellum Southern Exceptionalism: A New Look at an Old Question.” Civil War History, vol. 50, no. 4, 2004, pp. 418-433. Poethig, Luke. “The Evolution of Penn’s Medical School in the Middle and Late Nineteenth Century.” Penn University Archives and Records Center. www.archives.upenn.edu. 2011. Wall, Charles Coleman. “Students and Student Life at the University of Virginia, 1825 to 1861.” University of Virginia Ph.D. dissertation, 1978.